A New Map of Persia, from the Latest Authorities. 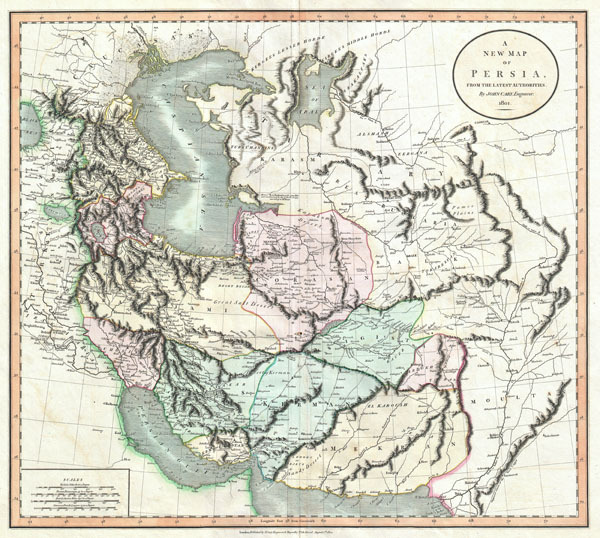 An exceptional example of John Cary's important 1801 map of Persia. Extending from the Black Sea coast eastward as far as Kabul and southward as far south as the Persian Gulf, this map encompasses modern day Iraq, Iran, and Afghanistan, the seat of the current hostilities in the Middle East. Offers extraordinary detail regarding cities, trade routes and physical geography. In some cases Cary offers annotations on important battle sites and on the ruins of ancient Mesopotamian cities. All in all, one of the most interesting and attractive atlas maps of Persia to appear in first years of the 19th century. Prepared in 1801 by John Cary for issue in his magnificent 1808 New Universal Atlas. Rumsey 1657.044. Phillips (Atlases) 714. The Map Collector, issue 43, p. 40-47 (Atlas). National Maritime Museum, v. 3, no. 311 (Atlas).